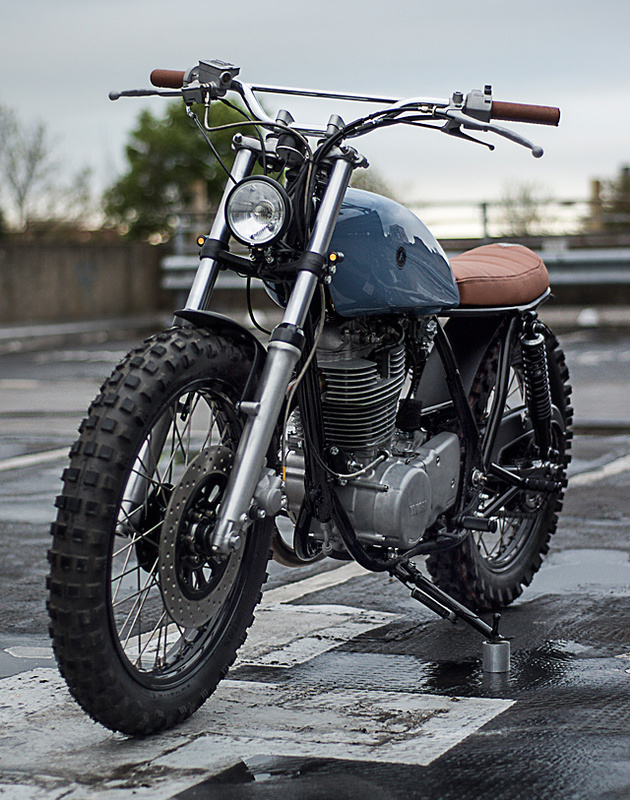 Auto Fabrica of North East London are fast becoming the place to go if an ultra-clean custom is what you desire. 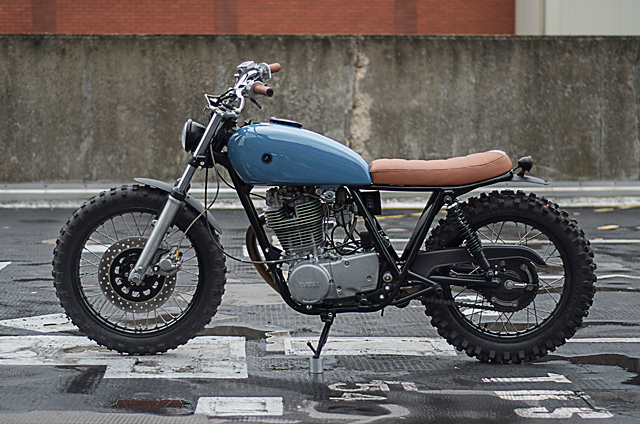 Run by brothers Gaz and Bujar, they have been creating tasty rides for a few years now. With technical backgrounds in design, and also offering an aqua blasting service, it is no wonder their finished products are clean in every way. 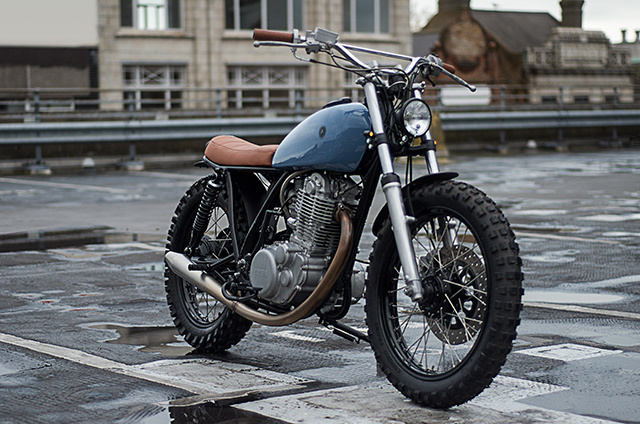 The end result are motorcycles that look like the sort of prototypes manufacturers might have come up with for their respective classic machines, with a level of fit and finish you don’t often see. 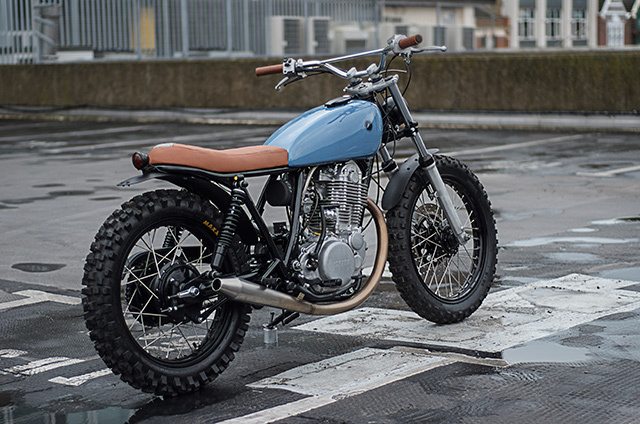 So when this old bruised and battered Yamaha SR came into the shop it not only required a full customisation but also complete restoration first to meet the lofty standards that Auto Fabrica set. There is little point beautifying an old machine that is going to break down on its first outing so the boys set about performing a full overhaul that would give their Italian client the reliability to match the look he desired. The bike was pulled down to the bare frame which has new seat rails welded in place along with a new rear hoop, there is also extra bracing for improved handling and new seat and fender mounts to improve their fit. Before the frame was ready for a fresh coat of colour all tabs and brackets that were not going to be used were removed and hard edges rounded off. With an uncompromising Scrambler look the ultimate focus, the gaudy cast wheels that came with the SR were never going to cut the Hot English Mustard. So a set of aluminium rims have been used in their place and stainless spokes have been laced to standard SR hubs. The ultra-aggressive rubber comes in the form of Maxxis MAXXCROSS IT hoops that are a street legal dirt tyre that still provide exceptional grip on tarmac, so much so that KTM use them on a variety of applications. Keeping the rubber planted to any surface are overhauled front forks and a set of new rear shocks with progressive rate springs. A cross drilled front disc uses a braided brake line and the rear drum provides important stopping power, particularly on loose surfaces where a firm hand will fold the front over. The look that Auto Fabrica achieve is always ultra clean and this build is no different with the right mix of raw metal, paint and leather. The standard tank was straightened and given a new rear mount before being coated in a custom blue with small black AF logos and a blacked out filler cap. The seat is covered in a tan leather that perfectly matches the overall colour palette of the build and features their signature triangle at the back in grey felt. To ensure the theme flows the grips utilise the same leather only in a thicker hide and hand stitched for durability. Keeping mud flung by the aggressive rubber away from rider and bike are custom fenders front and rear finished in a matte black so that they seamlessly blend into the overall design. The torquey single cylinder that is common to all SR variants is often treated only to a pod filter and new pipe but Auto Fabrica always take their builds that one step further. The engine was completely stripped down and aqua blasted giving the engine a uniform industrial look in the raw metals natural matte silver. To make the most of the bolt on modifications the bore now holds an oversized piston from Wiseco with the head receiving new valves and valve seats. Replacing the asthmatic factory carb is a Mikuni VM36 that not only drastically improves throttle response but gives a nice horsepower boost. Exhaling duties come in the way of a hand bent stainless pipe that feeds into a one-off hand-made rear muffler and you’ve got an SR lump that not only sounds great but has plenty of grunt. Steering the beast are a set of braced scrambler bars with wide grip location for maximum leverage on any surface. The stock controls and levers are in place but look brand new thanks to aqua blasting that extends to the master cylinder, switchblock and throttle housing. 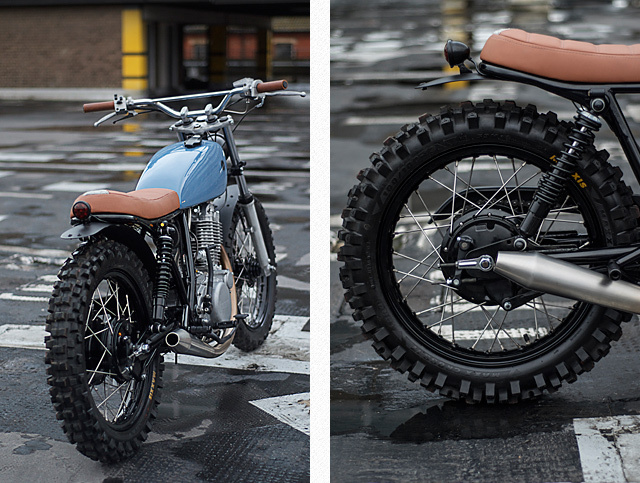 Lighting is typical scrambler with a small headlight and fender mounted tail light, but 21st century LEDs in the smallest of sizes provide a minimalist approach to turn signal duty. 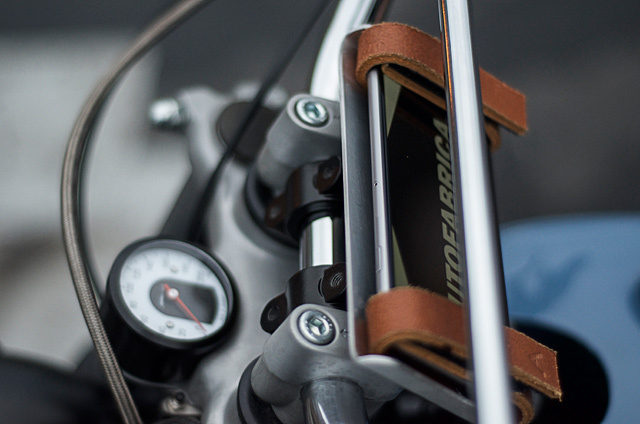 A Motogadget mini speedo is neatly mounted to the top yoke while a removable smart phone holder with stylish leather straps sits on the bar clamps if desired. 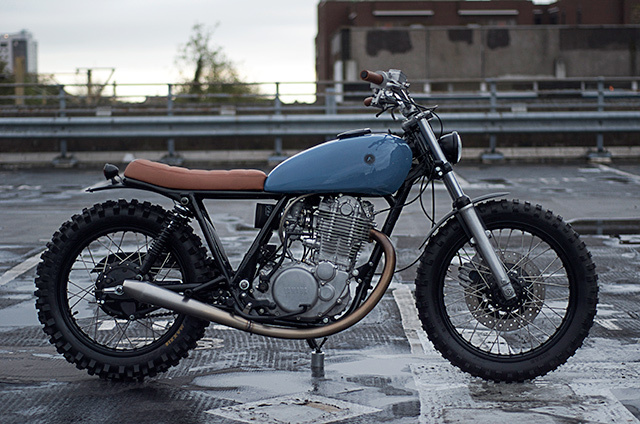 The third bike in a build of Yamaha SR Scrambler projects by Auto Fabrica known as Type 7 this particular bike is designate Type 7b and as Gaz describes “Overall we wanted to create a simple and elegant bike with some nice modern colour and trim details, the performance is an added bonus which means the client can enjoy the bike in either London or his resident city Milan”. When you consider Gaz and Bujar have only had Auto Fabrica operating for a few years, it’s scary to think just how good their future builds will be.